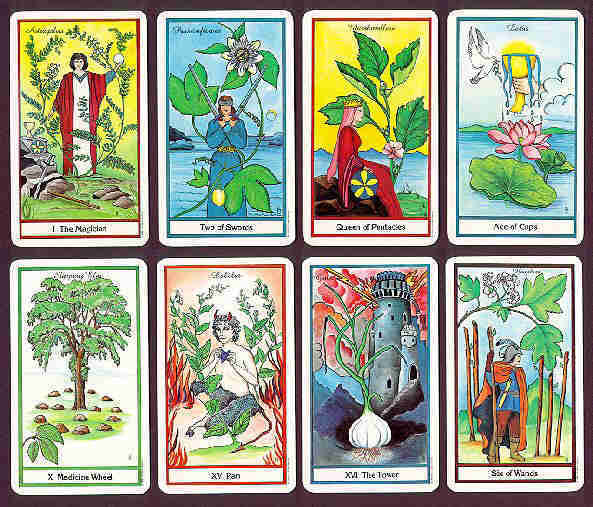 Or get the Herbal Tarot Deck by itself. Back of card: Green herbs, blue flowers on pale green background. Book included: Yes, 222 pages, illustrated. Measurements: 4.6 x 7 inches, or 11.6 x 17.7 cm. Publisher: U.S. Games, Stamford, CT. Deck printed in Belgium. Comments: Each card in this deck features a different herb identified by name. A card included with the deck reads, "The path of the herbalist is to open ourselves to nature in an innocent and pure way. She in turn will open her bounty and reward us with many valuable secrets. May the earth bless you."